Cyberbullying is bullying that is done through the use of technology, for example, using the Internet, a mobile phone or a camera to hurt or embarrass someone. It can be shared widely with a lot of people quickly, which is why it is so dangerous and hurtful. Don’t share your private information like passwords, name and address, phone numbers with people you don’t know. Be cautious about sharing photos of yourself, your friends and your family. Don’t respond to messages when you are angry or hurt – either to strangers or people you know. This will often encourage them to continue or increase their harassment of you. Log out and stop messaging if you feel you are being harassed. Remember you have the option to block, delete and report anyone who is harassing you online and on your mobile. Keep a record of calls, messages, posts and emails that may be hurtful or harmful to you. 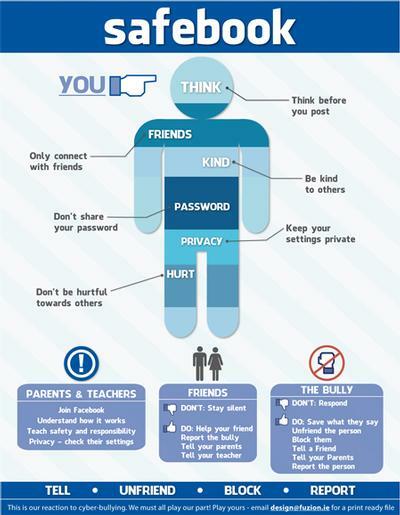 Remember to set up the privacy options on your social networking sites like Facebook in a way you are comfortable with. Everybody Matters, No Matter What Day!! Show Your Support and Wear ORANGE or PINK!! It was great to see the students getting involved in the ‘selfie’ competition for Anti Bullying and Harmony Day. Congratulations to Ruby Sutter, age 7 and Maddison Porter, Year 4/5G on winning a Highly Commended certificate in Interrelate’s 2016 Say No to Bullying poster competition. Ruby Sutter, age 7 and Maddison Porter, Year 4/5G, and their parents are attending a special Awards Ceremony on Friday, 18 March 2016 at The Concourse, Chatswood in Sydney, to mark the National Day of Action against Bullying and Violence.